Healthy Food for Kids and Babies. 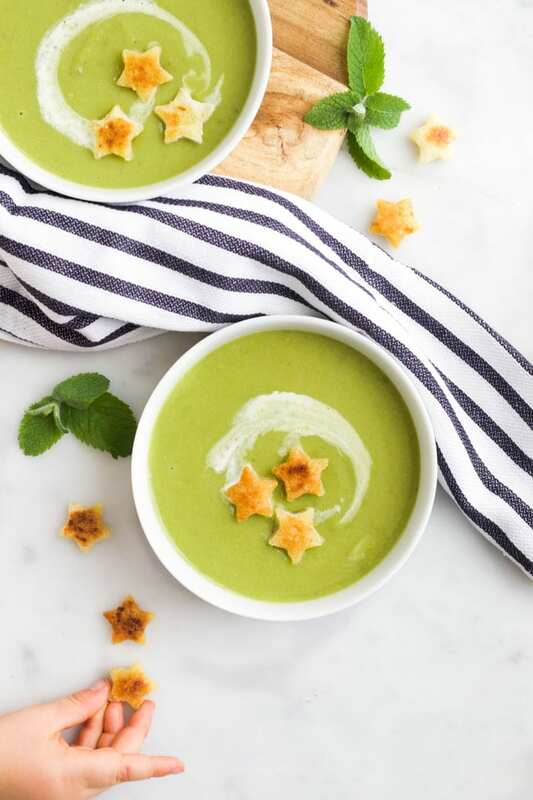 Pea and Mint Soup – Deliciously creamy, beautifully vibrant and delicately sweet. At the end of the week, when the cupboards are pretty bare, I can usually count on finding some stray veggies to whip together a pot of soup. 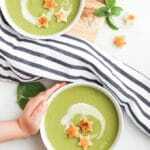 A bag of frozen peas is pretty much guaranteed to be in the freezer, making this Pea and Mint soup a staple in our household. Olive Oil – You can replace with a different oil or with butter. Potato – For soups and stews I normally recommend using a waxy potato that holds its shape better. However, as this soup is blended it isn’t a requirement. I use whatever I have available! Stock – Chicken or vegetable stock. If making for a baby, use homemade chicken or vegetable stock to keep sodium levels lower. 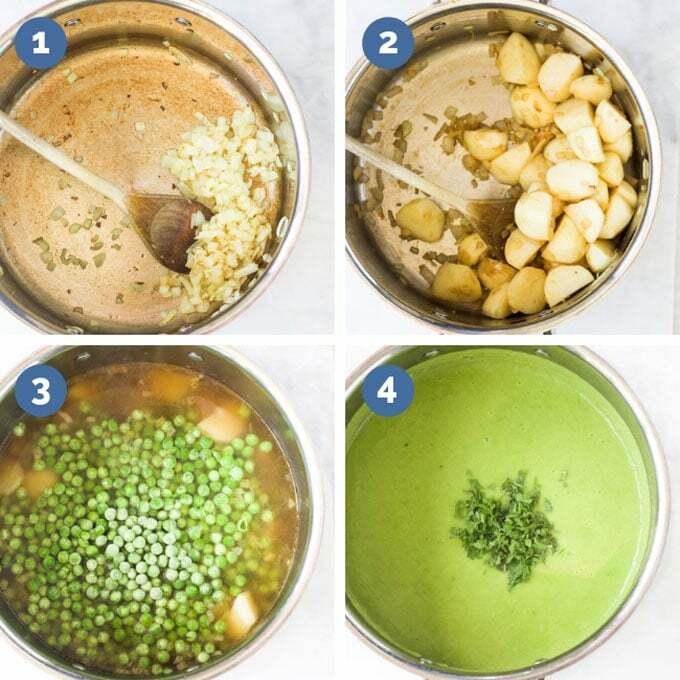 Frozen Peas – You can use fresh if you prefer. Lemon Juice – I always use fresh. Mint – Start with a little and add more as needed. Check that the potatoes are done after the cooking time – a fork or tip of a sharp knife should be easily inserted and removed. The peas only need to be added in the last few minutes. 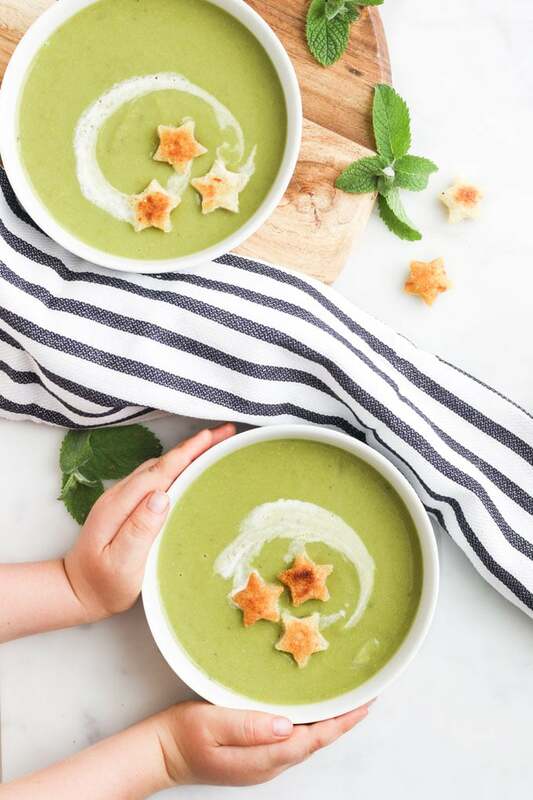 Blend the soup before adding the mint and gradually add the mint, allowing your kids to taste test. That way, if you have a child who doesn’t like a strong mint taste, you can remove a bowl before adding extra mint. If you don’t have a stick blender, allow to cool slightly before transferring to a blender or food processor. Provide something to dip with – fresh bread, buttered toast, oatcakes, cracker or savoury scones. Croutons – As you can see from the photos, I added some star croutons. Use a star cookie cutter to cut star shapes from a slice of bread. Fry in a little olive oil until nicely toasted, about 3-5 minutes. Cheese – Provide a little pot of finely grated parmesan (or cheese of choice) to dust over the top of the soup. Mint – Some fresh mint leaves, whole or chopped. When refrigerating or freezing soup you want to make sure it has fully cooled down before placing in the refrigerator or freezer. Refrigerating – Transfer leftover soup to an airtight container and refrigerate for up to 3 days. Freezing – Transfer leftover soup to an airtight container/containers. Leave about a 2-3 cm (1 inch) of space between the soup and the container’s lid when filling it. This will allow room for the liquid to expand when frozen. Defrost, overnight, in the refrigerator. A deliciously smooth and creamy soup with a gorgeous vibrant colour. Add the garlic and stir for a further minute. Peel and dice the potatoes, add them to the pot and cook for around 2 minutes. Add the stock, bring to a boil, cover and simmer for 12-15 mins. Add the peas and continue to cook for a further 3 mins. Add the lemon juice and then blend the soup (I used a hand blender) until smooth. Add the mint and blend again. Taste and season, adding more mint if desired. If cooking for a baby use homemade stock or baby stock cubes. If the soup is too thick you can add some more stock to thin it. If you do not have a stick blender, allow to cool slightly before adding to a blender or food processor to blend. You can add all the mint before blending but mint can be quite a strong flavour for kids. Start with a little mint, let them taste it and add more if desired. Nutritional information is a ROUGH guide only, calculated using an online nutrition calculator.